Music is a beautiful gift from God, and He has woven it into the fabric of humanity. For Christians, music takes on even more significance since it is one of the ways we communicate the beauty of God’s majesty and glorify Him with our talents. At BJU you’ll explore the intricacies of piano through careful study and concentrated practice under highly qualified and experienced faculty. You’ll lay a strong foundation in music history and theory through your courses and in putting your skills to the test—both in your weekly lessons and in live performances. In addition, you’ll learn how to teach piano skills to others through what you’ve learned both in your courses and your personal interaction with faculty members. And most importantly, you’ll deepen your relationship with the Creator, who made you and music for His glory, and learn how to imitate the One who rejoices over His people with singing. 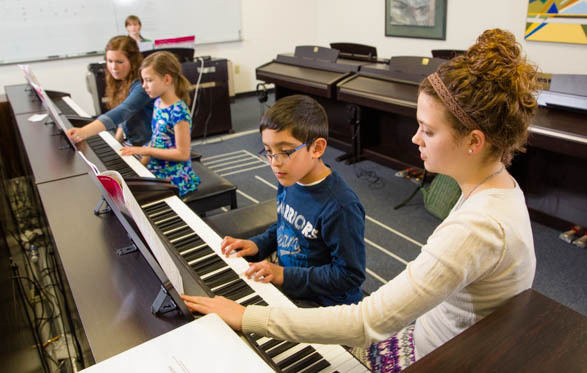 Within the piano pedagogy program at BJU, you’ll build a solid foundation in theory and technique. You’ll learn how elements—including tonality, harmonic sequences and chromaticism—work together to create coherent and expressive music, and you’ll learn how you and your students can use each element to create compelling music. You’ll sharpen your skills in performance and in accompanying other performers or your own students effectively. Your sophomore year, you’ll prepare for your platform check, a performance in front of several members of the music faculty. In this performance, the faculty will evaluate your musical skills and determine how you’ll continue your studies at BJU. You’ll also take a technique test that will display your proficiency on the piano. Once you pass each of these checks, you’ll prepare for more recitals that will challenge you and refine your skills on the piano. The highlight of your program is our four-semester-long internship program, where you’ll put to use your knowledge and skill of piano as you teach others. Beginning your junior year, you’ll teach 3rd graders in a group setting. The second semester you’ll follow up with an individual student after the group teaching and learn how to tailor your teaching to that student. Your senior year, you’ll focus primarily on teaching private lessons and learning from other teachers as you observe them weekly. Each semester is designed to build incrementally on your practical knowledge of piano pedagogy and increase your confidence as a teacher. When you arrive for your first semester, you’ll need to audition so your music background and current skill level can be evaluated. The audition will help the music faculty assess your potential as a music student and will give them a good idea of how to equip you to reach that potential. One to three faculty members will be present for your audition. Liberal arts courses, such as economics, philosophy and speech, will challenge you to see life from a broader perspective. These subjects will also help you develop essential life skills such as critical thinking, problem-solving, creativity and effective communication—skills necessary for flexibility in your job. The importance of communication skills cannot be overstated for a musician, and these core courses will enhance your powers of expression and pedagogy. In addition, your Bible courses will connect your pursuit of God to all of life—including your work as a piano teacher. These courses will better equip you to pursue God and will remind you to allow your knowledge of Him to inform your ethics and practices in teaching piano. And more importantly, you’ll learn how you can point others to the beauty and holiness of God and the hope found only in the person and work of Jesus Christ. 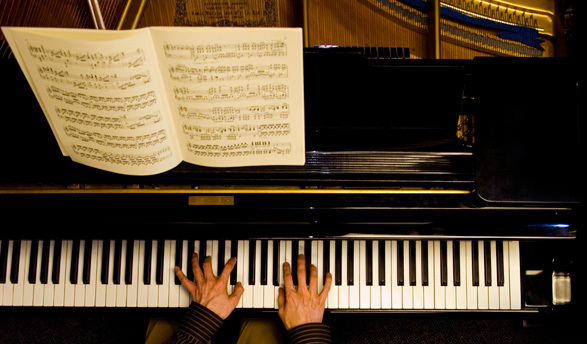 The piano pedagogy program offers you the option of adding some electives to your class schedule. If you’re planning on running your own studio or giving private lessons, consider taking business courses. You’ll learn useful administrative skills and build a foundation in the basics of running a small business. Another option is to take courses in technology, which will further develop what you learn in your program and equip you to take advantage of some powerful tools in the music field. I’ve only been out of BJU a few years, but already I can see how much I use from what I learned in the pedagogy major. I feel like piano pedagogy gives the perfect blend of high classical music training and practical business/classroom skills. The internship especially is invaluable to those wanting to start a studio or teach in a school. It provided me with a whole collection of lesson plans, games, letters to parents, lists of concepts and how to teach them, and a general understanding of most method books—all before I even started teaching! I have seen how this is a big advantage for a new teacher and am so thankful that I had that in this first year of teaching. The recitals and practice hours, on the other hand, grew me so much as a musician. I am certain that without that training, I would not have as much credibility and subject knowledge for my students. I don’t perform regularly, but it helps to be able to demonstrate smooth scales and arpeggios in a way that makes the students’ eyes light up! BJU offers students a variety of ways to network with employers and organizations. A multitude of job opportunities are posted each year on Career Central, our online job board. In addition, more than 60 businesses and 150 Christian schools/mission boards/Christian organizations come on campus to recruit students through on-campus interviews and job/ministry fairs. Career Services also helps students by holding seminars on resume preparation and interview techniques. View Gainful Employment data for this program. Once you complete your platform check during your sophomore year, you’ll prepare for two recitals: one in your junior year and one in your senior year. These recitals are a significant part of the keyboard performance program and play a major role in preparing you for your profession. Each of these recitals is designed to help you build your repertoire, teach you how to prepare for performances, and give you practice memorizing your pieces, playing in various styles and using appropriate technique. Practice studios, each equipped with an upright piano or a grand piano, are available for your use across campus (including in a few residence halls). These studios are in addition to faculty members’ studios, which come equipped with grand pianos. If you’re focusing on organ performance, you can practice and perform on a handful of pipe organs or synthesizers that are scattered across campus. At BJU, you’ll experience a variety of excellent performances—as a performer and as a member of the audience. You’ll grow through personal performances, through junior and senior recitals, large and small ensemble recitals, the Concerto and Aria Competition, Annual Music Contests, and Student Recital Hours. Additionally, you’ll be exposed to accomplished artists in the Concert, Opera and Drama Series, such as The King’s Singers, Canadian Brass and Prague Symphony Orchestra. The piano lab contains several Yamaha Clavinovas that give you more flexibility than acoustic pianos. Each Clavinova comes equipped with MIDI ports so you can easily compose, record and share files with the help of computer software. There are more than 20 groups you can get involved in, ranging from a number of larger choirs to smaller instrument ensembles, such as the trumpet choir or the handbell choir. These groups will give you experience as one part of a whole, so you’ll be better prepared to lead others in similar situations. There are numerous outreach opportunities each week. Many of them will stretch you by using your music skills, either as an instrumentalist or in leading the music. You’ll learn how to minister alongside others, so you’ll feel better prepared for the ministry you’ll take part in after graduation. BJU’s keyboard performance faculty bring 30–40 years’ experience in the field to their classrooms and studios, as well as their education from PhD, MEd and DMA programs at leading universities. They’ve contributed to the keyboard studies field in many ways, including producing published arrangements and piano textbooks. And each faculty member makes sure your learning is personalized, so you can grow to your fullest potential as a musician and performer. Apply knowledge of pedagogical literature, materials and methods to piano teaching. Perform memorized public recitals with skill. Integrate music theory and performance in literature interpretation.